Ovation thunderous for the Spanish pivot, who debuted in his new home with an excellent last quarter before a few Nets that almost give the surprise. 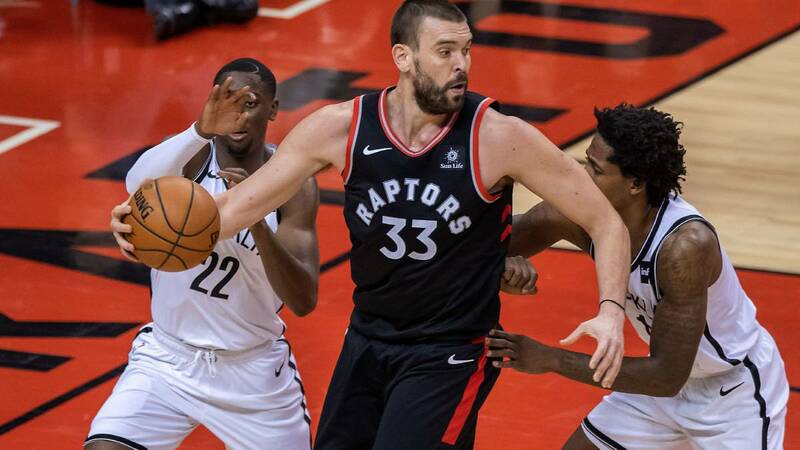 With the public of his new home, the Scotiabank Arena, standing and in the middle of a thunderous ovation, Marc Gasol debuted in Toronto as a player of the Raptors nine minutes into the game. He entered in place of another Spaniard, Serge Ibaka, and before some Nets who sold their defeat face (until the last moment, literally: 127-125). "It was like having butterflies in the stomach, like being rookie again," said a Marc who is getting used to the East, to Canada, to a franchise that wants to play the NBA Finals (a competitive blessing for him at the sight of his last months in Memphis) and play alongside Kawhi Leonard, with whom he fought so many battles when one was in Memphis and the other in San Antonio. This is the NBA. For the moment, Marc has won his two games with the Raptors, with (that's) just a +7 total difference. Your team (42-16) is still in the back of the Bucks and with a good cushion over Pacers, Sixers and Celtics. In the East, the field advantage promises to be especially important in a second round that can be fierce (if, as they should, come Bucks, Raptors, Sixers and Celtics). From the 19 minutes in New York to 22 this time, Marc returned to be a substitute and anchor for a second unit that was especially effective at the start of the last quarter: the Spaniard scored in that partial 11 of his total 16 points and gave his two assists (he also took 6 rebounds) . Surrounded by the activity of Anunoby, Powell, Green and McCaw (VanVleet is injured and the signing of Jeremy Lin is still unofficial), gave his team a cushion (108-101) that he had vanished (122-125 at the last minute) under a triple downpour by D'Angelo Russell (28 points, 7 rebounds, 14 assists), Crabbe (22 points) and Joe Harris (24, 7/8 from the line of three). But the Raptors scored the last five points, a three pointer by Danny Green and, after Harris failed, a basket from midway Kawhi, very own, which sealed the victory before a final error by Russell. It was an excellent game and Nick Nurse, who wants to leave Marc space to acclimatize, showed that he knows exactly why he wants Spanish, of which he praises the defense, the hardness ... and above all the intelligence and the ability to pass. The Raptors, with him on track, will adopt an attitude of moving until he finds them. And that is very good news for him, although for now his coach (not something important right now) keep in the quintet the frontcourt Kawhi (30 points, 8 assists), Siakam (17 + 4 + 4) and Ibaka (18 points) , 12 rebounds, 9/13 shooting) . The Nets have lost five of their last six games. They ran out of Dinwiddie and LeVert is back but he's still far from his pre-injury level. They still compete hard and the East gives a lot of margin for error, so for now there's no need to sound the alarms on a Kenny's team Atkinson who also broke into praise for the new kid of the Raptors, Marc Gasol: "Domina from the post, will make your team much more dangerous" .